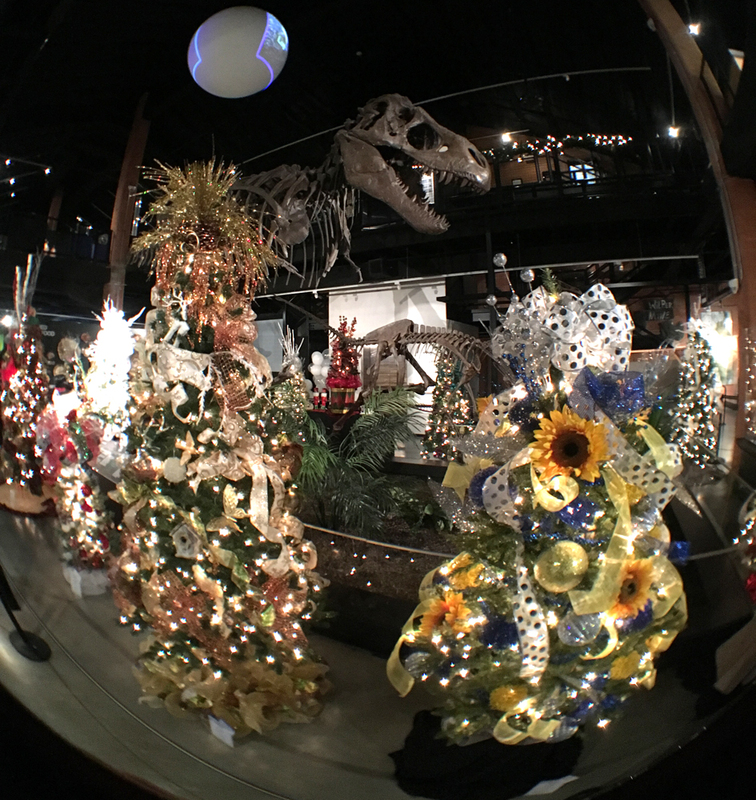 Through the doors of the Houston Museum of Natural Science at Sugar Land, you usually see the towering display of a Tyrannosaurus rex. 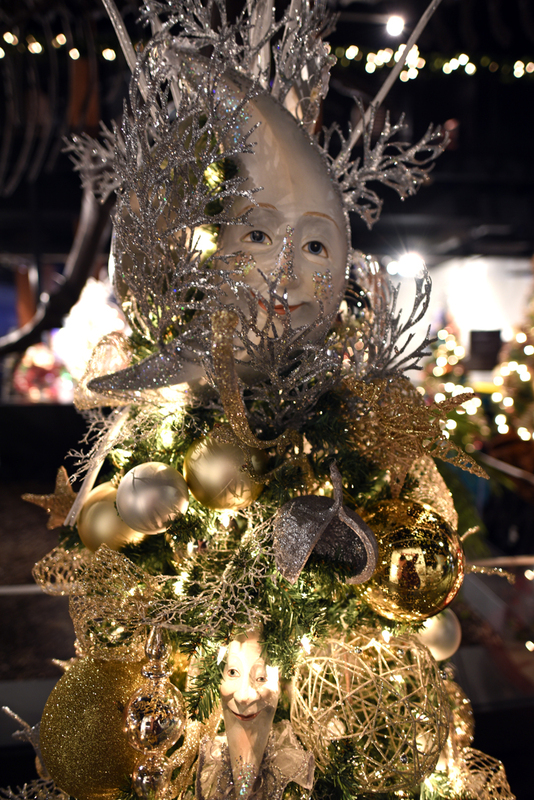 But these past few weeks, that sight has been amplified in the twinkling light of custom-decorated holiday trees. 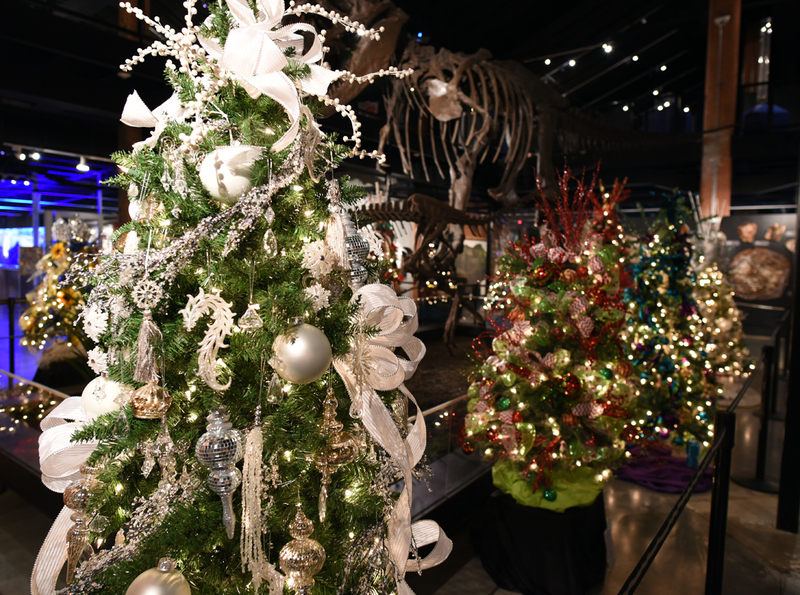 When you walk through the front door of HMNS-SL, trees now surround the T. rex display. 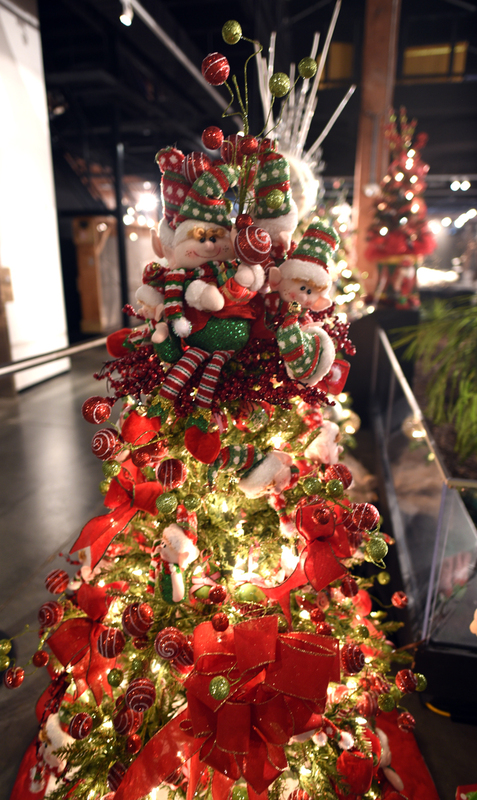 The collection of trees are ready to go to the highest bidder through the museum’s Jingle Tree program, an annual online and live auction fundraiser that benefits the museum. 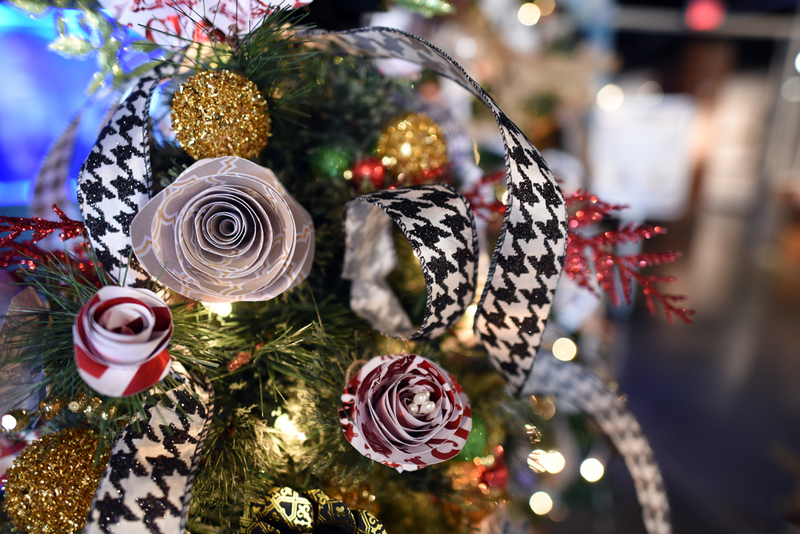 From frilly to sparkly, these trees are a fascinating display of the creativity of the Fort Bend designers, volunteers and artistic visionaries who made them. 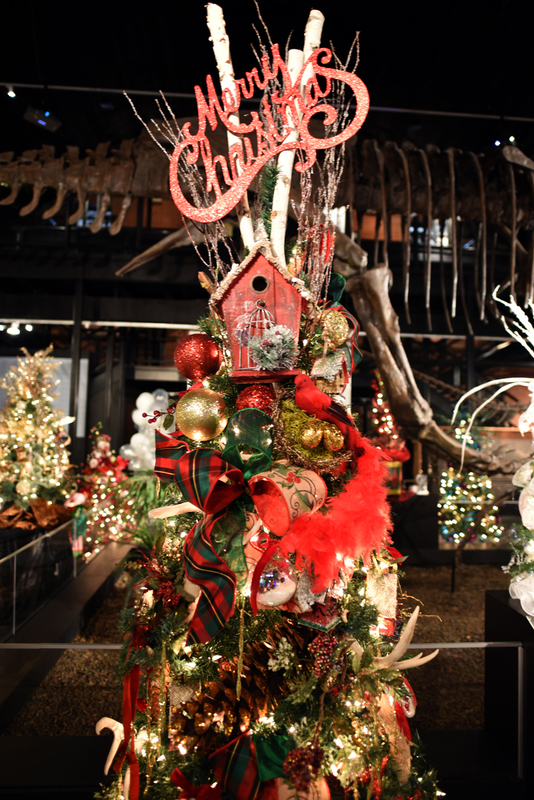 Some even include wild themes that push the look of the traditional holiday tree to the limits. Check these out! 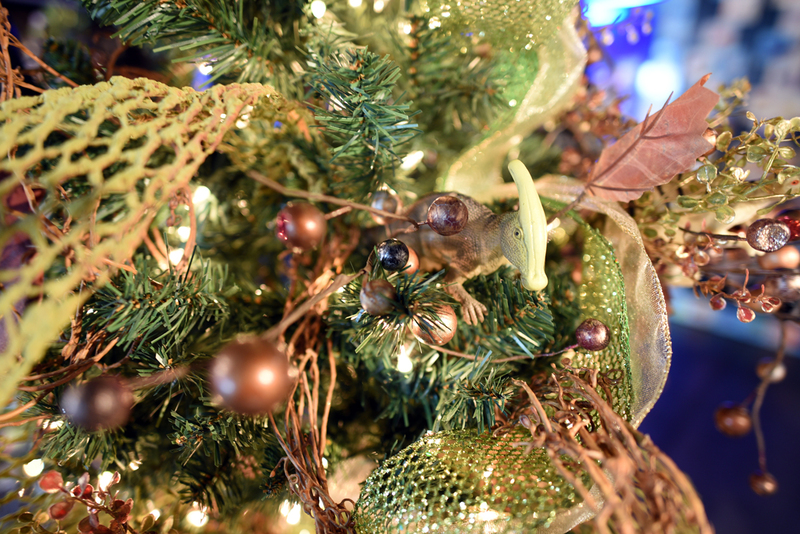 Trees with a traditional look offer a lineup of the best in ribbons and ornaments. It’s like a fashion show for tannenbaums! Here’s a close-up of the white-and-silver accents on Diamonds Are a Girl’s Best Friend! Santa’s mischievous helpers are playing at the top of Elves Made Me Do It. Wonderful hand-made paper roses and pinwheels in Flower Power! This tribute to the natural world called Enchanted Forest comes with wood accents and, yes, antlers! Now get an eyeful of these non-traditional looks. Sleepy crescent moons make this tree, Love You to the Moon and Back a celestial beauty. 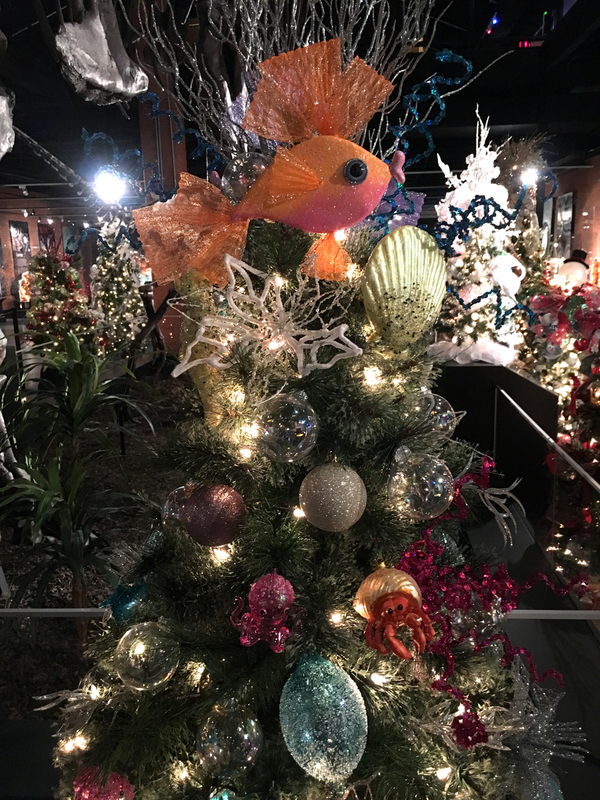 This tree, named SEAson’s Greetings, looks like it went snorkeling and brought back some friends! 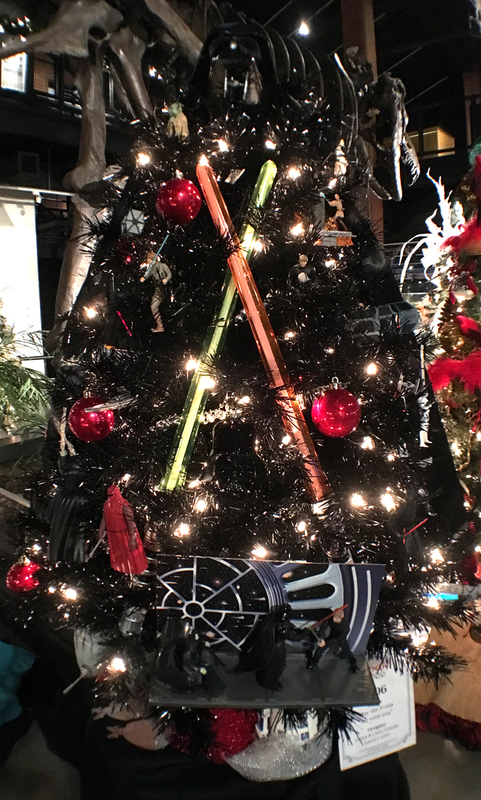 Take a close look at this Star Wars tree. Yes, those are lightsabers, and yes, that’s Darth Vader at the top! 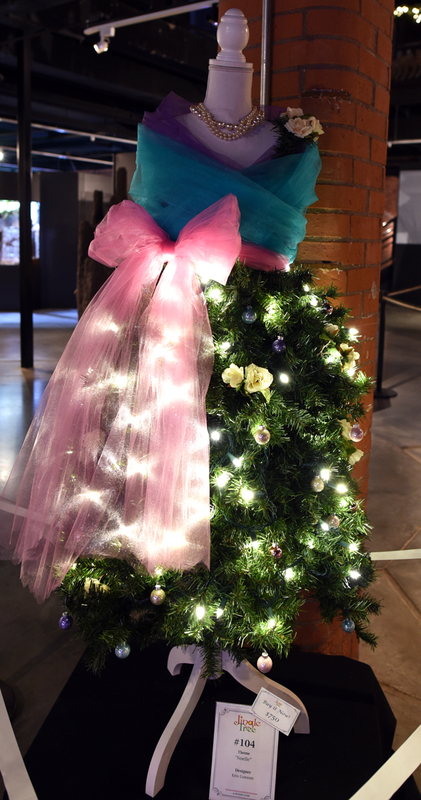 This tree, named Noelle, is the belle of the ball, showing off its fashion sense. And finally, nothing says HMNS like dinosaurs! 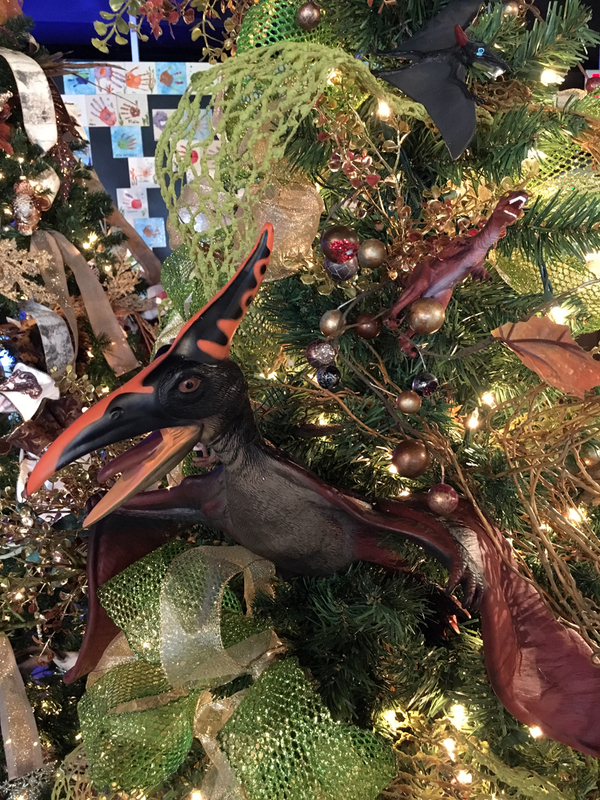 Plastic toys large and small cling to the branches in Dinotopia. There’s many more where that came from, and you can see them all at the third and final tree-viewing event, the Jingle Tree Happy Hour. 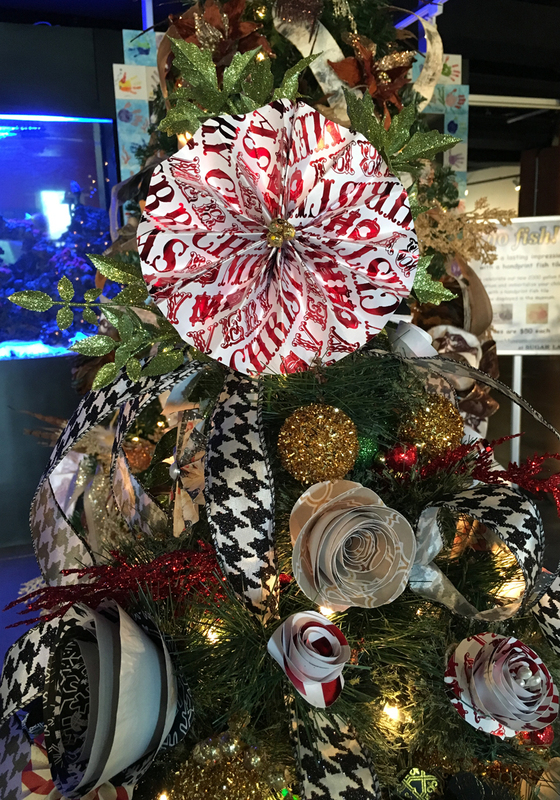 Come out Thursday, Nov. 19 from 5:30 to 8:30 p.m. to have some cocktails and bid on trees and other items in a live auction. 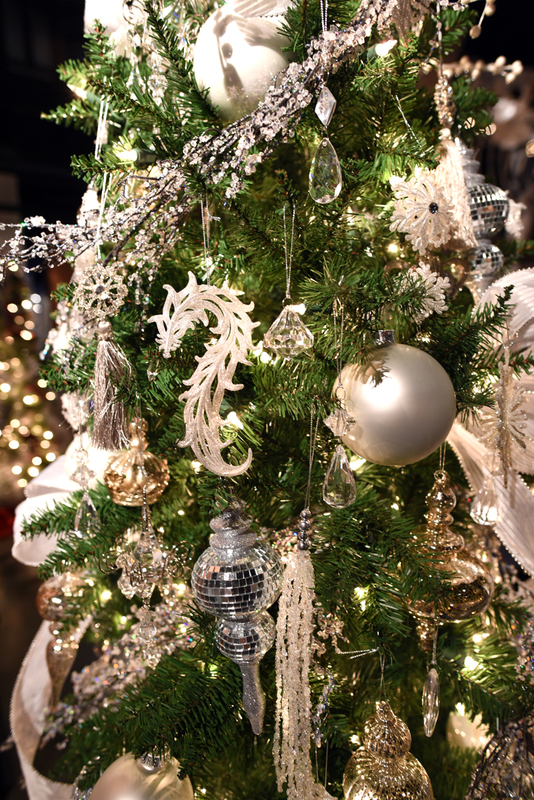 Don’t miss the opportunity to take one of these gorgeous pre-decorated trees home for the holidays! Editor’s Note: All photos by Kelly Russo.